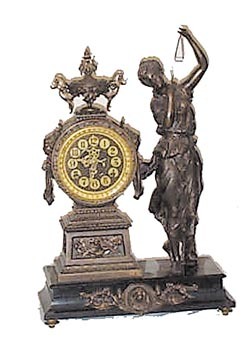 Ansonia Clock Co. figure clock, "Juno", ca 1894. Usually Juno is matched with the statue "Muse", and the pair together are called, "Muses". The black enameled iron base has a few small paint chips, which any of the bases will have if they haven\'t been recently refinished. Complete with the feet and very elaborate front ornaments. Clock tower has the correct urn and side pieces. This clock has the unusual brown dial, recessed circles with good gold . French sash, beveled glass, open escapement recessed in the inner dial, and great Ansonia hands. Entire tower and statue finished in a Japanese Bronze color, and about as good as you will find not to be refinished recently. The statue is complete with the wand and triangle Correct pendulum for this 8 day movement. Strikes half hours on a gong. This clock is one to keep. Ly-Ansonia No.535.